When pipe liners are installed, they are first soaked in a pipe lining resin to ensure they adhere to the host pipe while they are curing. At the end of the curing process, the pipe liner is as hard and durable as a new pipe. In general, there are three different types of resins available for CIPP lining, including polyester, vinyl and epoxy. 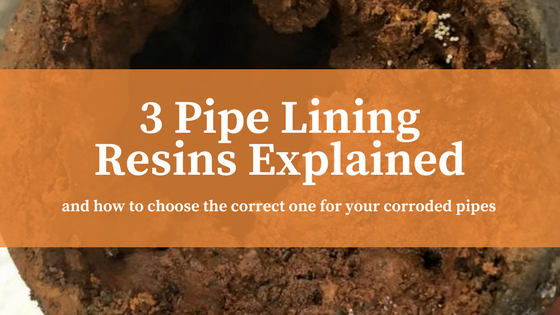 When it comes to lining plumbing pipes, there are numerous resins available with which to soak the liner. Each resin has its own benefits and drawbacks, and some resins are used for specific applications, like large sewer lines, or because exhibit certain properties, extreme corrosion resistance. Polyester resin is the most affordable type of pipe lining resin available. It is primarily used in large municipal plumbing projects, like sewer lines and storm water drainage systems because it meets a great many of the municipal codes when it comes to municipal lines. It can also be mixed in such a way that the cure time can be altered from just a few minutes to several weeks. The latter is beneficial for projects that are miles away from the contractor’s location because they can pre-soak tubes in the polyester resin and ship them to the remote job site for insertion. Polyester resin works best in areas that are well ventilated, like outdoor job sites because it contains a strong odor and carcinogenic compounds that can make it unsafe. For those reasons, it is not typically used on indoor plumbing systems. Polyester resins also tend to shrink as they cure, which can be problematic if the shrinkage is not calculated correctly. Vinyl resin is a hybrid of epoxy and polyester. It is typically used where extreme corrosion resistance is needed as that is the primary benefit of this resin. It is similar in cost to epoxy resin. Since it has polyester properties, it also has the same drawbacks, including noxious odors and cancer causing VOCs. However, there are some vinyl resins currently in development that contain no VOCs or cancer causing styrene. Vinyl resin is also prone to shrinking as it cures. Epoxy resin is the most expensive of the three types of resins. However, it does not contain any dangerous fumes or VOCs, and it does not shrink as it cures. These properties make epoxy resin the go-to choices for lining indoor commercial, industrial and residential plumbing pipes. Unlike vinyl and polyester resins, epoxy resin cannot be premixed and the liners cannot be pre-soaked prior to transport. Instead, it must be mixed on-site because of the short curing times. Once the two-part epoxy is mixed, it must be poured into the pipe liner and inserted into the lateral pipe to cure. The benefit of this is that the epoxy resin cures fairly quickly, which means the pipes can be returned to service quickly. Here at Nu Flow, we use epoxy resin for residential, commercial and industrial pipe lining projects because it is durable, long-lasting and does not contain any VOCs or noxious fumes that would make the epoxy pipe lining installers or occupants of the building ill. It also has a short curing time, which means your plumbing pipes can be returned to service faster, and when it comes time to mix the epoxy and soak the liner, our epoxy pipe lining professionals always use drop clothes and clean up any accidental spills so that your building looks exactly as it did before we arrived. To learn more about how epoxy pipe lining can restore your corroded plumbing pipes, call us at 815-790-9000. We can also perform a whole building pipe assessment to determine if your building would benefit from pipe lining.